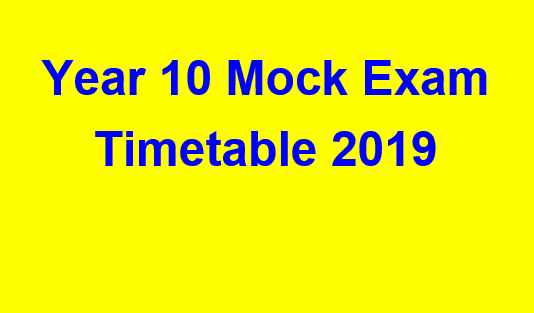 Please click here for more information and timetable……..
Below is a copy of the Year 10 mock exam timetables. These are internal exams and students will be required to attend normal lessons. Please make sure students have a good breakfast and they have the correct equipment with them for each exam, including a calculator (if needed) and a black pen. If they wish to, they may bring water, but this needs to be in a clear plastic bottle with the label removed. Please remind your child that under no circumstances should mobile phones be taken into exam rooms. If your child is unable to attend any of their exams, please call the attendance line as usual and we will require a letter from your doctor.